contact Marty Hageman or contact Dan Berg. 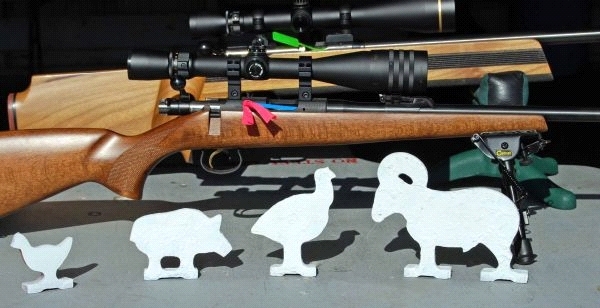 The Hunter Rifle Silhouette Match is a casual and fun shooting activity designed for the informal shooter. It is a great way to meet your fellow club members, engage in friendly competition, mentor a young or new shooter, talk shooting and enjoy the outdoors while giving you a reason to dust off your favorite or neglected hunting or plinking rifle. This match is open to non-members. ALL RANGE SAFETY RULES will be observed. Read them and follow them please. 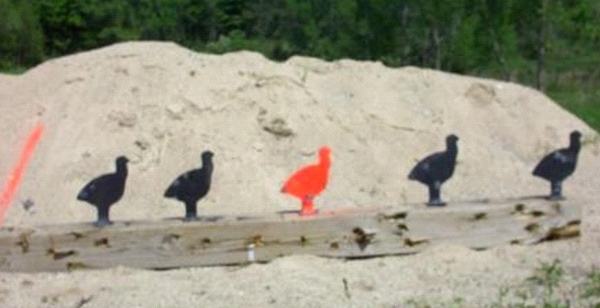 5 Standard Rifle Silhouette Targets are placed at 4 ranges. Any hunting or plinking rifle excluding magnum calibers, 22 magnums or 17 rim fires. Any action types (bolt, single shot, semi auto, or lever) are allowed. You may compete with either iron sights or scope. Slings are allowed. PLEASE, NO PENETRATING AMMO, due to potential TARGET DAMAGE! All DBCL Safety Procedures will be in effect. All firearms must be uncased and cased in front of the RED line on a bench. ALL uncased Firearms must have a chamber flag inserted and magazine removed when not in use, Chamber flags are available and will be provided. Eye and ear protection is required for everyone during the HRS Match unless range bell in ON. All commands and decisions of Range Officer(s) are final. No handling of any uncased firearms while Range light and bell are ON or while anyone is down range. Firearms may only be loaded on firing line, at the command of the Range Officer(s). Magazines may be pre-loaded, but kept out of firearms until Range Officer(s) commands. Any firearms or ammunition that Range Safety Officer(s) deems unsafe will be removed from event. After shooting, do not leave the line until your gun is verified empty and clear by a Range Officer. "Shooter to the line" - Move into position at the shooting station. "You May Load" - Load your magazine or set up revolver rounds. "Shooter’s Ready?" - Acknowledge you are ready or request more preparation time. "Standby" - Position firearm in a shooting position. "CEASE FIRE" - Quit firing and set firearm down with muzzle downrange. "Unload and show clear" - Remove magazine, empty chamber, lock action open. Present for verification. once verified clear. "Flag and Rack your Firearm" - Place chamber flag in chamber and firearm in the RACK. "Clear Station: - Clear station of ammunition, magazines etc. Move behind RED line. "Re-Set Targets" - Once Range light and bell are ON and range officer indicates; re-set targets.